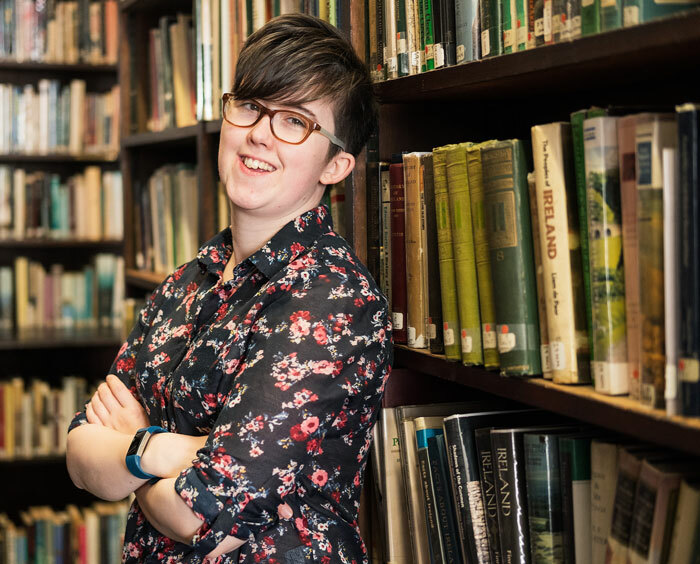 Lyra McKee is a freelance writer and an editor for Mediagazer, a Silicon Valley-based publication covering the media industry. She has recently signed a two-book deal with Faber & Faber. ‘Angels with Blue Faces’, is her first book, about a Troubles-era cold case murder of an MP, and due out later this summer. She’s currently working on the second, ‘The Lost Boys’, about a series of disappearances. I don’t know that I’m doing enough to address this, but Belfast must do more to help people realise their potential. We don’t have a vision for what this place can be, and when people lack vision and hope, they don’t have anything to strive towards. Some of our brightest people flee, never to come back. Maybe our biggest challenge is how we break through the expectations set for us based on where we’re from. The tale of Belfast is a tale of two cities: on the one hand, if you’ve got prospects and a talent that’s been recognised, it’s a great city. But, when you have nothing, the city has nothing to offer you. It can be a really cruel place for working class kids. There’s a poverty of vision and a poverty of ambition for young people, fed by a culture of undermining achievement. I’m from a working class community. I’ve experienced how the city has preconceived ideas about working class kids and what we’re capable of achieving. Belfast needs more hopeful role models for youths growing up in places like Ardoyne and the Shankill. I spent a lot of time plotting my escape from here. Life kept happening, though, and then I met a Derry woman and there was definitely no hope of leaving! But I’ve managed to carve out a career doing what I love, often just by bringing back opportunities: with the Internet, you can work from anywhere in the world. So I love that I get to work from home for a publication that’s based on the other side of the world and to tell Northern Ireland’s stories to a wider audience. Looking back, I was lucky: we didn’t have a lot of money and my mum was sick, but I had people who had faith in me, even when I didn’t. They changed the outcome of my life. I hope by telling my story, and helping other people tell their stories, that I can break down some stereotypes around what is required to do what you love. The education system here has had a toxic impact on people who can’t afford tutors. I couldn’t even sit my Transfer, I was flunking the mock exams so badly. One teacher said I would never make it beyond my GCSEs. My whole future was being decided based on the fact that I was a 10-year-old who couldn’t cope with the stress of exams. Families from poor backgrounds struggle to advocate for themselves and they defer to the judgement of authority figures because they believe they’re “smarter”. So a judgement like that, of a child’s abilities, can be taken as Gospel, as they say in north Belfast, meaning it can dictate the belief of both child and parents about what they can achieve. It certainly makes me realise the impact of people. I was so lucky. I had a 4’11” grandmother who would have cut the legs out from underneath you. She didn’t give a damn what teachers said about my abilities. I was in remedial classes for reading and writing, there was nothing to suggest I might have a talent for writing. I’d had a hearing and speech impediment which meant I didn’t learn to speak properly until I was around five or six, and reading and writing came even later. But, for some reason, she was obsessed with the idea I was going to be a writer and bought me books every week. One year, she bought me ‘Harry Potter’ and saw that I devoured them. So she started to point out the similarities between my life and JK Rowling’s: that she was a single parent and I was from a single parent family, that she had no money and we were stone cold broke. When I got to high school, I had this amazing English teacher who set off a fire in my head by telling me I had a gift for writing. And another English teacher, when I was 15, introduced me to an organisation that trained young people in journalism. If I look back on my life, there’s a series of moments where key people, nearly all women, just encouraged me to explore a path, from my Mum to my big sister to those two teachers (and many, many more I can’t list here). Three things are important: a city that encourages, that champions entrepreneurship, and that connects people from all backgrounds with opportunity. I’d never be doing what I do without people encouraging me to think differently. In a wider sense, the city has an amazing class of creative entrepreneurs, from writers to artists to filmmakers and board game designers. But the focus on job creation is on attracting technology companies and call centres. We can do better than that. We are a city of creators and entrepreneurs: supporting 20 micro-businesses should be valued as highly as attracting a high tech company. That has to be partly how we build economic futures for people in the city. Ultimately, if you don’t have hope, what do you have?